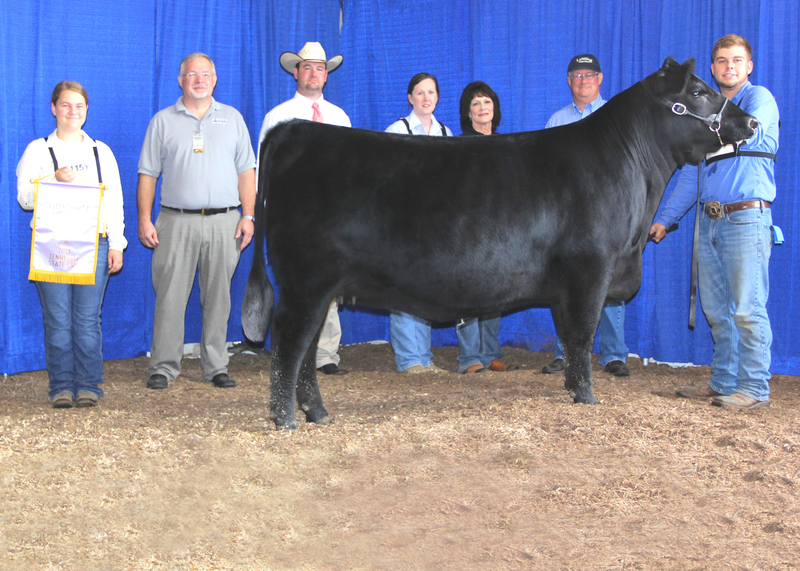 Angus exhibitors led 130 entries at the 2014 Tennessee State Fair Roll of Victory (ROV) Angus Show, September 7 in Nashville, Tenn. Kevin Rooker, Uniontown, Pa., evaluated the 101 females, 23 bulls and six cow-calf pairs. Champion Hill Georgina 8154 won grand champion cow-calf pair at the 2014 Tennessee State Fair Roll of Victory (ROV) Angus Show, Sept. 7 in Nashville, Tenn. Caroline Cowles, Rockfield, Ky., owns the February 2012 daughter of S A V First Class 0207. A January 2014 heifer calf sired by S A V Bismarck 5682 completes the winning duo. Kevin Rooker, Uniontown, Pa., evaluated the 130 entries. Photo by Alex Tolbert, American Angus Association. Kody Miller, Mount Olive, Miss., owns the grand champion bull. 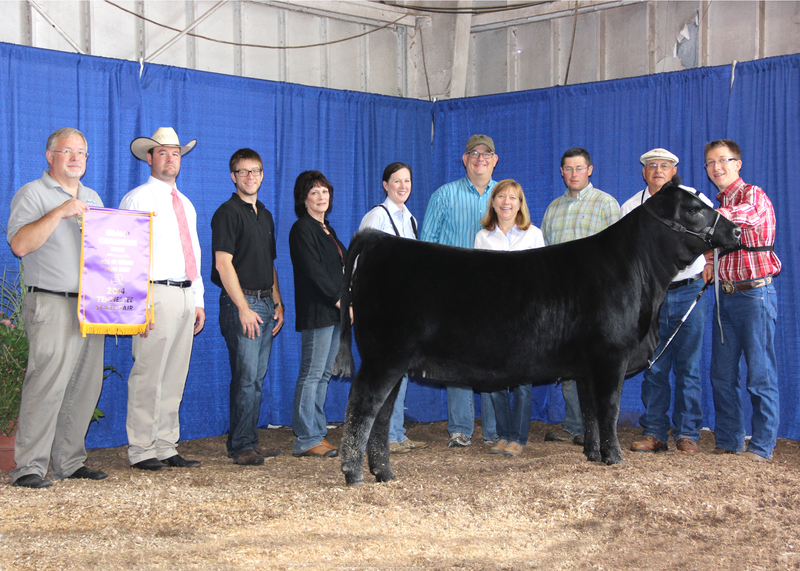 APS Heritage is a January 2014 son of PVF Insight 0129 and first won junior calf champion. Destinys Sound 38 won reserve grand champion bull. 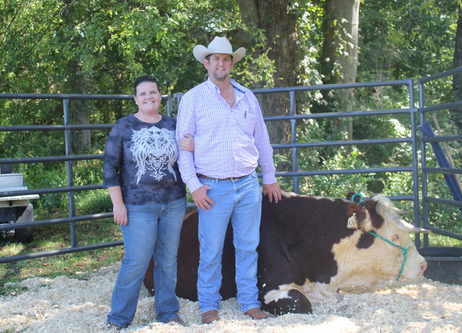 Morgan Hutchins, Columbia, Tenn., owns the February 2013 son of Whitestone Rogue Y242 that first won junior champion. David Smith, Boulder, Colo., led the grand champion female. Champion Hill Georgina 8547 is a November 2013 daughter of S A V Angus Valley 1867 and first topped the senior calf division. QVS B K Georgina 293 claimed reserve grand champion female and junior champion. Jake Smith, Cullman, Ala., owns the February 2013 daughter of S A V Pioneer 7301. 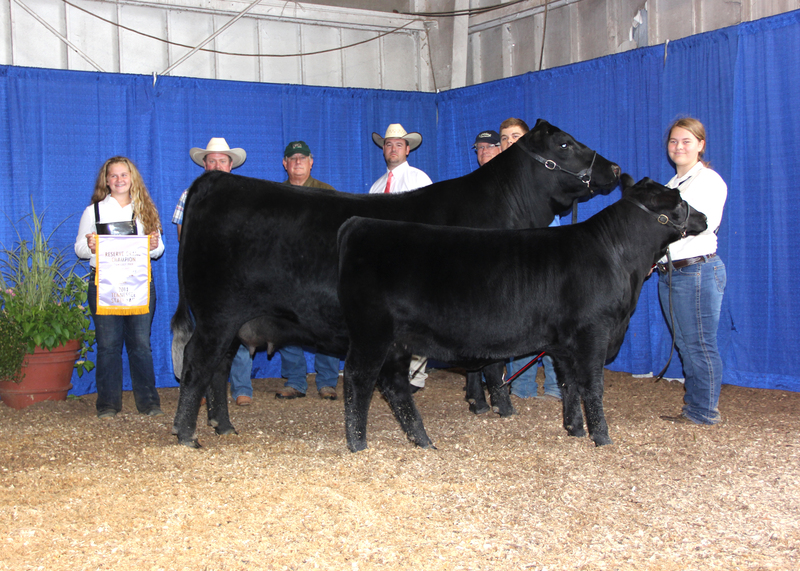 Caroline Cowles, Rockfield, Ky., showed the grand champion cow-calf pair. Champion Hill Georgina 8154 is a February 2012 daughter of S A V First Class 0207. A January 2014 daughter of S A V Bismarck 5682 is at side. 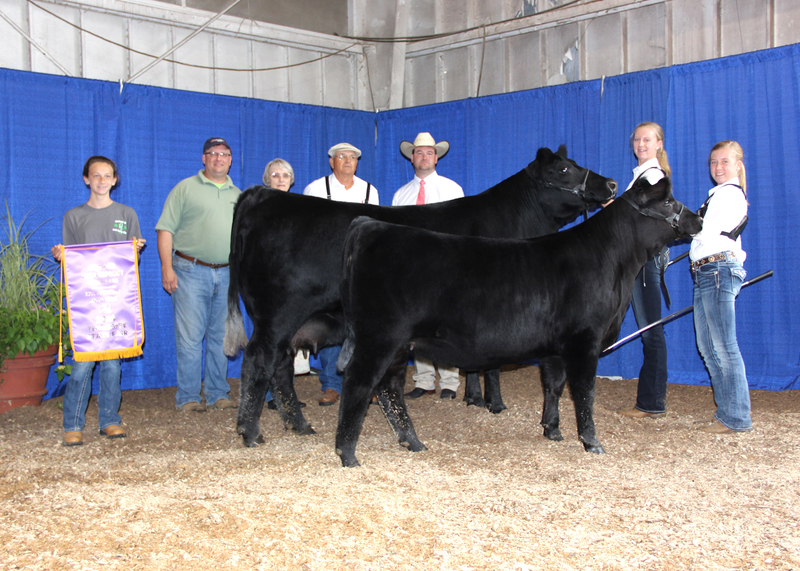 Jake Smith, Cullman, Ala., showed the reserve grand champion cow-calf pair. Q V S Georgina 4142 is a February 2012 daughter of S A V Brave 8320. A February 2014 heifer calf sired by S A V Bismarck 5682 is at side. Q V S Georgina 4142 won reserve grand champion cow-calf pair at the 2014 Tennessee State Fair Roll of Victory (ROV) Angus Show, Sept. 7 in Nashville, Tenn. Jake Smith, Cullman, Ala., owns the February 2012 daughter of S A V Brave 8320. A February 2014 daughter sired by S A V Bismarck 5682 is at side. Kevin Rooker, Uniontown, Pa., evaluated the 130 entries. Photo by Alex Tolbert, American Angus Association. 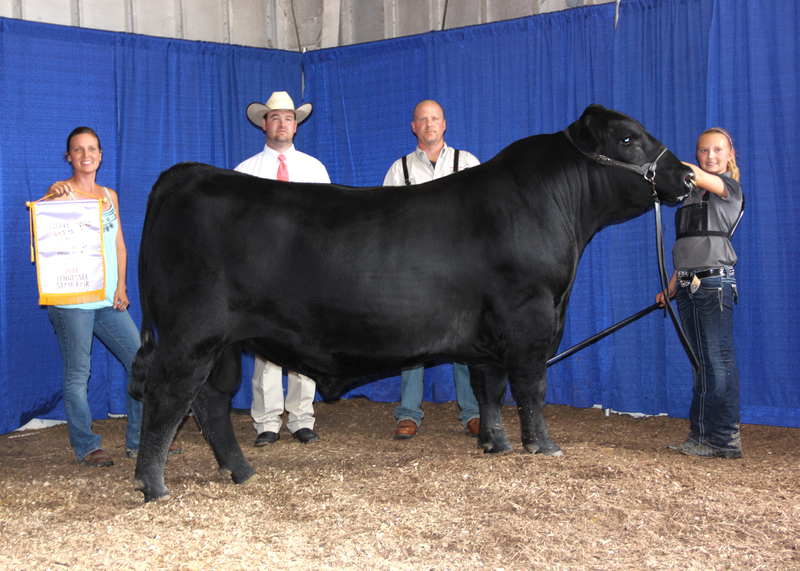 APS Heritage won grand champion bull at the 2014 Tennessee State Fair Roll of Victory (ROV) Angus Show, Sept. 7 in Nashville, Tenn. Kody Miller, Mount Olive, Miss., owns the January 2014 son of PVF Insight 0129. He earlier won junior calf champion. Kevin Rooker, Uniontown, Pa., evaluated the 130 entries. Photo by Alex Tolbert, American Angus Association. 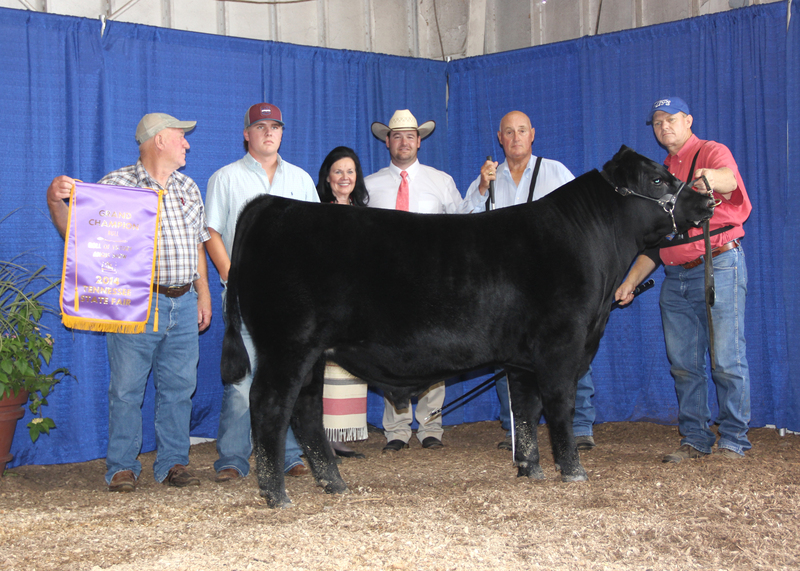 Destinys Sound 38 won reserve grand champion bull at the 2014 Tennessee State Fair Roll of Victory (ROV) Angus Show, Sept. 7 in Nashville, Tenn. Morgan Hutchins, Columbia, Tenn., owns the February 2013 son of Whitestone Rogue Y242. He first claimed junior champion. Kevin Rooker, Uniontown, Pa., evaluated the 130 entries. Photo by Alex Tolbert, American Angus Association. Champion Hill Georgina 8547 won grand champion female at the 2014 Tennessee State Fair Roll of Victory (ROV) Angus Show, Sept. 7 in Nashville, Tenn. David Smith, Boulder, Colo., owns the November 2013 daughter of S A V Angus Valley 1867. She earlier won senior calf champion. Kevin Rooker, Uniontown, Pa., evaluated the 130 entries. Photo by Alex Tolbert, American Angus Association. QVS B K Georgina 293 won reserve grand champion female at the 2014 Tennessee State Fair Roll of Victory (ROV) Angus Show, Sept. 7 in Nashville, Tenn. Jake Smith, Cullman, Ala., owns the February 2013 daughter of S A V Pioneer 7301. She first claimed junior champion. Kevin Rooker, Uniontown, Pa., evaluated the 130 entries. Photo by Alex Tolbert, American Angus Association. 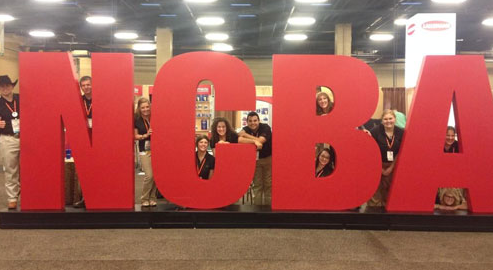 The National Cattlemen’s Beef Association is accepting applications for internships during the 2015 Cattle Industry Convention in San Antonio, Texas, Feb. 4-7, 2015. The deadline to submit an application is Oct. 6, 2014. 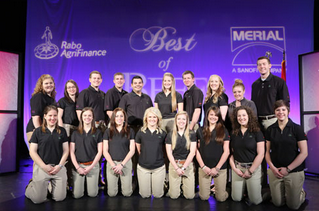 The Cattle Industry Convention internship program. This year will mark the 117th Cattle Industry Convention, which is the oldest and largest convention for the cattle industry. The convention and trade show create a unique, fun environment for cattle industry members to come together to network and create policy for the industry. The annual Cattle Industry Convention boasts over 5,500 attendees and a trade show with more than 250 booths. Interns are offered a unique, behind-the-scenes experience of setting up the trade show, manning the NCBA Political Action Committee booth, assisting with the NCBA-PAC auction, helping members vote on NCBA policy, working with the media and helping to guide cattlemen and cattlewomen to convention events. To apply, interested college juniors, seniors or graduate students should submit the convention internship application, a college transcript, two letters of recommendation and a resume to internship@beef.org. More information and the internship application are available on NCBA’s website. Applications are due October 6. This morning, I have a special opportunity to advocate for the cattle industry. 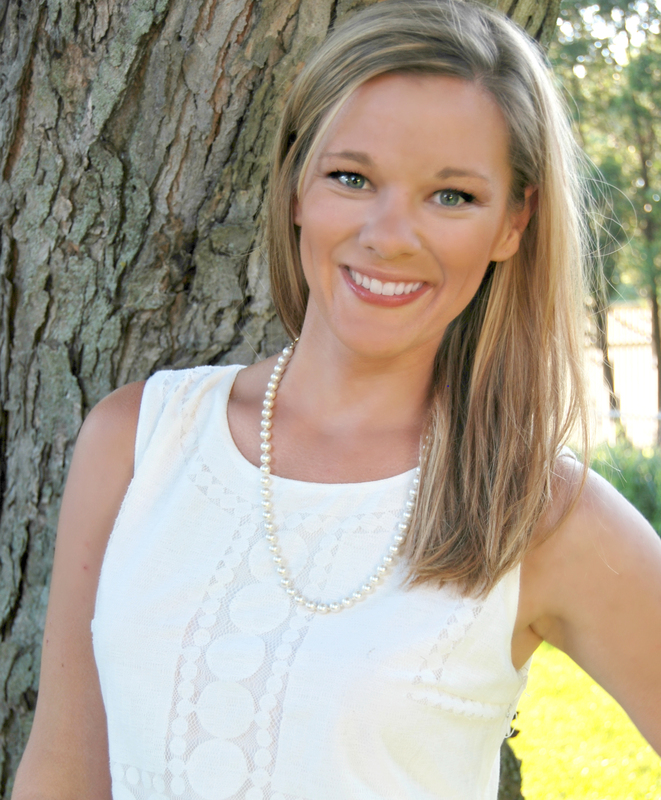 Lauren Chase, Director of Communications for the Tennessee Cattlemen’s Association. I was invited to speak to the Mass Communications class at Middle Tennessee State University in Murfreesboro. Professor Alligood asked me to discuss job possibilities outside of traditional media, and also, talk about the need for good communicators in the agriculture world. Many students in attendance do not have a background in ag, so I’m thrilled to share my passion with them. The cattle business is a business. The industry is constantly improving and innovating…how we do things may change, but the need for marketing has not. Promoting a farm brand and developing a sound marketing plan goes hand-in-hand with raising the best livestock we can. Each respective social media site, like Facebook and Twitter, has millions of users and many of those are your perspective customers. Advertise your bull sales, show off your herd through uploaded photos, share stories about your family’s involvement in the operation, engage with customers, etc…The ideas are endless. It’s cost-efficient and an easy way for you to market your business. Sites like Twitter and Pinterest, along with various photo-sharing apps like Instagram, utilize hashtags to spread your content across the networks. Hashtags operate like keyword searches…by adding the pound sign (#) in front of a word, you now make it searchable. For example: I am in the market for a Black Angus bull in Tennessee. 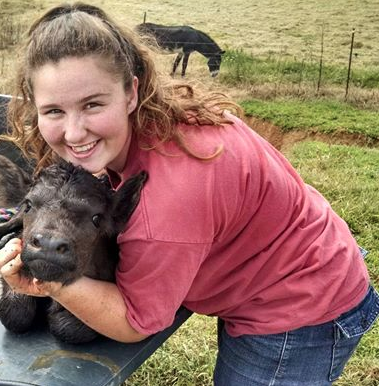 I can go to Twitter and in the search box, type: #Angus #bull #Tennessee and hit enter. A list of all tweets with those hashtags in them are displayed and now, I have a list of users across Tennessee tweeting about their Angus bulls. This idea also works for beef and agriculture advocacy, with the ability to reach consumers across the world searching for beef information or agriculture facts. These are two reasons why social media is important from a consumer standpoint. Through sites like Facebook and Twitter, you can be instantly connected with your family, friends, acquaintances, customers, industry colleagues, consumers and anyone else across the world. Just as importantly, you can be reached by these people to answer questions about food production, animal care, beef nutrition, etc. You become their go-to farmer/rancher/producer. We all know that technology plays a big part in the work we do…whether it’s a record-keeping app or texting photos of cattle to a buyer. However, the mainstream consumer may not realize just how modern our work is. If we can show them that we know how to tweet, we then create a common ground with consumers. We are relatable to them and appeal to millennials, who are our future food buyers and public voters. These young people need to be on our side and if we can build relationships with them now, it’ll help for years to come. If you have scrolled through your newsfeed on Facebook lately, you’ve notice that it’s full of videos, photos, graphics, and smiley face emojis. The world is all about visuals and boy, do we have some beautiful imagery to share in our business! Tennessee landscape is gorgeous…and coupled with the beauty of life on the farm, we can show the world the beauty that surrounds our lives. The cattle business isn’t always “peaches ‘n cream,” but I know most farmers and ranchers would say that they wouldn’t change their lifestyle for anything. Just remember this: you have a great story to tell and with social media, it’s impact can go farther than ever before! Please be sure to follow TCA on Facebook and Twitter and if you have any story suggestions for the blog or magazine, please email Lauren: Lauren@tncattle.org. Welcome to the official blog of the Tennessee Cattlemen’s Association. 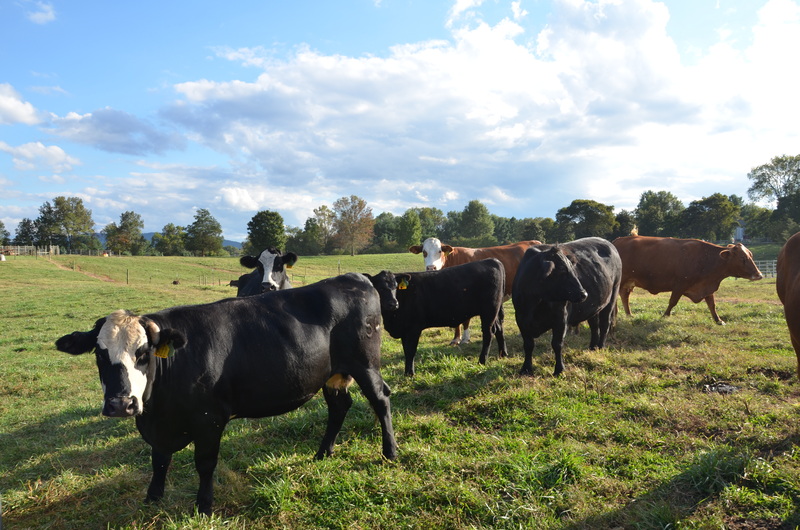 On this blog, you’ll find stories featuring Tennessee cattle families and information to help make our businesses successful. We hope to be a resource to not only the cattlemen and women in the state, but also to the thousands of people who enjoy beef products every day. If you have press releases or blog post ideas, please send an email to TCA’s Director of Communications, Lauren Chase at Lauren@tncattle.org. She is always looking for your input and together we will help the beef community thrive. To become a member of the Tennessee Cattlemen’s Association, please call (615) 896-2333 or visit our office located at 530 B Brandies Circle, Murfreesboro.